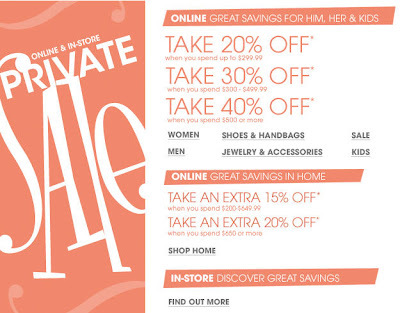 Bloomingdale's is having a private sale in-stores and online through Thursday, Apr 2. The discounts are quite complicated, so click on the image to see the full email. Ricky's is a NYC institution for those of us devoted to beauty (read: ALL New York women). Shop online with code "DAILYRICKY" and get 25% off everything. End date unknown. Thanks, Daily Candy! For NYC-ers only. Shop at the Vince store in the Meatpacking district (833 Washington St; 212-924-0370) and get 25% off if you bring in a print out of this Daily Candy email. Promotion ends Thursday, Apr 7. Use code "PEOPLE20" and take 20% off non-sale items at RevolveClothing. Ends Thursday, Apr 23. One day, one location. Scoop is cleaning out their mens and womens FW09 clothing, discounted up to 70% off. agnès b. will be having a fabulous sample sale at Redbag! You'll find major discounts on previous seasons and discontinued styles. Clothingline is having a Vera Wang Lavender sample sale. Get tops, blouses, sweaters, shorts, skirts, and pants, as well as the requisite day/cocktail/evening dresses. Dressing room closes 30 min before store closing. Hit up the J. Mendel sample sale and find pieces from their RTW collection, cocktail dresses, gowns, evening separates, furs and accessories from 75-90% off retail. I have been on a need-more-dresses kick recently. I've gotten a RED Valentino off Yoox, a Juicy Couture sundress on sale from Saks, a really cute one from H&M (retail $24.90), and a fabulously flowy one from the Marchesa sample sale. I know I need to slow down, but this upcoming sale is going to make it hard: Elie Tahari is having their spring sample sale, up to 80% off. I cannot believe I forgot to post on this!! I am so sorry! 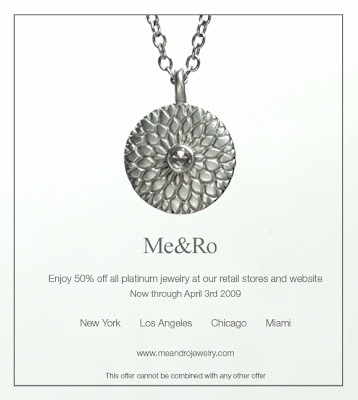 Me&Ro is having an unprecedented 50% off all platinum jewelry (even the diamonds) online and in-stores. Ends next Friday, Apr 3. Ending at 6AM tomorrow morning, William Rast has taken 20% off everything on their website. Hurry! I just bought all the birthday, wedding, anniversary, graduation, and thank you cards that I'll need for the next year (in addition to some just-in-case gift wrap, gift bags, and tissue paper). Last year I got the Papyrus membership ($10) for the buy-3-get-1-free bonus (year-round). With their more frequent promotions, though, I am not feeling the need to renew that. Case in point: today-only, take 25% off everything or 20% off custom printing with code "PRIVATEMAR", which is better than the 20%/15% promos I've seen in the past-- take advantage! *When I checked out, I put in the code but the discount was not reflected. Hopefully they will adjust this at processing. I have stayed away from Uggs. I loathe them on starlets prancing in the 80 degree LA weather, I don't buy shearling, and honestly, I think they are hideous. But while gingerly negotiating bad weather this winter in my heeled Prada boots, I came to the conclusion that I need ugly-tromping-around-boots that I don't really care about, and Uggs popped into my mind. Should I break down and get some? I remember when Kate Spade Sam bags were all the rage. I was in college, working at J.Crew for $6/hr, too parsimonious to splurge. However, if you were someone, you had to have one. People would go to desperate lengths to get the look, and I'd often see an errant Kate Spade label on the mall floor, evidence of the high quality of counterfeits. I'm glad those days of wishing I had the money are over, but it still feels good to keep some in your wallet. 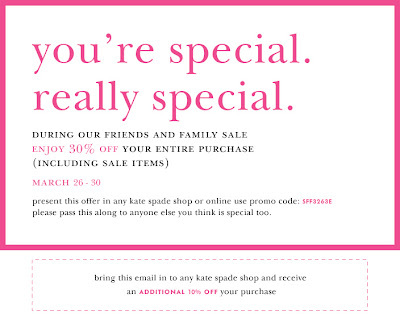 Get your Kate Spade and save 30% during the F&F event (even on the sale stuff). Shop online with code "SFF32630" or print out the image below and take an extra 10% off in-store. Ends Monday, Mar 30. 3/26–3/28 Cynthia Rowley's sample sale features up to 80 percent off apparel and accessories. Current full-price merchandise is also 20 percent off. 376 Bleecker St., nr. Charles St. (212-242-3803); Th–S (10–9). If you are a MOMA member, take 20% off everything you buy in-store and online from the Museum of Modern Art, including Muji at MOMA! Ends Sunday, Mar 29. It's that time again! 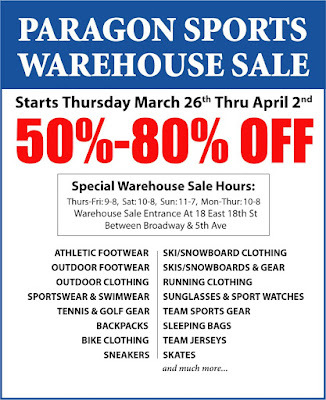 The Paragon Sports warehouse sale starts today and runs through next Thursday, Apr 2. Get a sporting 50-80% off clothing, footwear and gear, roughly defined as athletic/outdoor footwear, running clothing, ski/snowboard clothing, ski/snowboard equipment, backpacks and luggage, golf equipment, tennis racquets and bags, team jerseys, sportswear and more. What are you waiting for? Global Fashions presents women's and men's spring 2009, Moschino, See by Chloe, Missoni bathing suits, Mikael Aghal evening wear, Alexander McQueen, and much more at up to 80% off. This sale features couture gowns, eveningwear, cocktail dresses, sportswear, swimwear, and accessories. Also, find designer handbags by Missoni, Byblos, Gianfranco Ferre, and many others. I am always leery of these mass-brand sample sales, but since the source is the venue itself (Openhouse Gallery) and SOS seems to be a repeat customer, I will take their word that this is going to be a good sale! Just looking at the list of brands available (and there are a ton, including Jil Sander, Helmut Lang, Hugo Boss, Dior, and [allegedly] Prada and Gucci bags) there will be tons of merchandise for both men and women. Prices are traditionally 50-75% off retail. Catherine Malandrino dresses? Count me in! 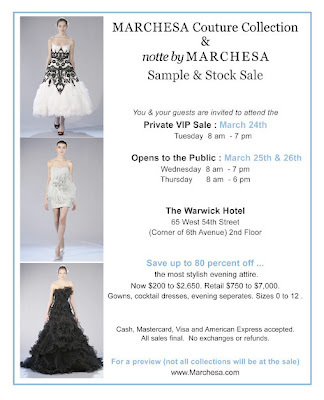 The Marchesa sale continues to enthrall me. Prices are fantastic and selection is good, and this time, the selection is even better than last and prices are slightly lower. AND, if you buy 2 or more short dresses, they take 20% off. Not too shabby. I am absolutely kicking myself for not going to the F&F preview yesterday because things are going fast. There is a huge, mouth-watering selection of long gowns, though, for those of you with occasion to wear them (and yes, I am quite pouty that I don't). 100% silk stoles in black, forest green, navy, red, maroon, taupe, dusty rose, and dusky sky are only $40. Run, don't walk. 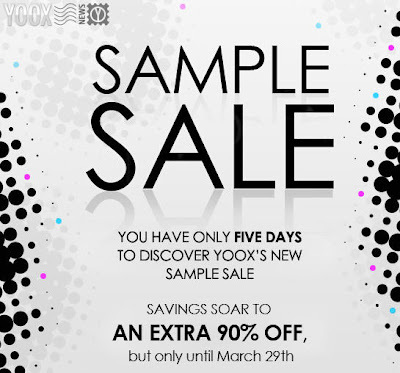 For the next five days, YOOX is having a 'sample sale'. Prices up to 90% off, all sales final. Ends Sunday, Mar 29. Use code "SAVE40" to take 40% off Splendid and Velvet clothing at online retailer IvyBlue. Using my link will get you free shipping on your order (it won't have to be $100+). Ends Friday, Mar 27. When/Where: Wednesday, March 25th and Thursday, March 26th. Daily 10am—7pm. 12 W 57th St between Fifth and Sixth Aves (212-247-2239). **It took a few days for me to get it. Thanks Abby, for passing this along! From now until Friday, Apr 3, take 15% off everything on the Lauren Moffatt website with code "INSIDER". As the mama of 1 dog and 2 cats, the ASPCA is very close to my heart and one of the non-profits I support most strongly (the other being the Komen foundation). Therefore I feel compelled to encourage ladies to go shopping tomorrow down in Soho at Tibi. (Besides, their clothes are perfect for that day-to-night look.) There's no discount, but 15% of sales goes to ASPCA! Calling all fashionistas and fans of animals! Tibi, Soho's chic women’s clothing boutique, is hosting a very special pet adoption and shopping event to benefit the ASPCA—and you’re invited. When: Wednesday, March 25, from 4:00 P.M. to 8:00 P.M.
Why: The ASPCA Adoption Van will be on site with a wonderful selection of available pets—you just might find furry love. Why Else? : 15% of the boutique’s sales on Wednesday will be donated to the ASPCA. Look smashing while you help support the ASPCA’s lifesaving programs! I have yet to visit the new Caudalie spa at The Plaza, but it is definitely on the top of my list! I highly recommend the crushed cabernet scrub to rejuvenate yourself and get circulation going. It just feels... healthy. (and not oily!) Get yours, or whatever else you want, for 20% off during their F&F event. Use code "VINESALE" from Friday, Mar 27 through Tuesday, Mar 31. USA only. Twice a year, people get into a frenzy and wait for hours in line. This is it. You'll find lots of mens ties and personal furnishings, women will find bags, belts, shoes, and tons of scarves. The last sale was in September and you can read Racked.com's sale report. 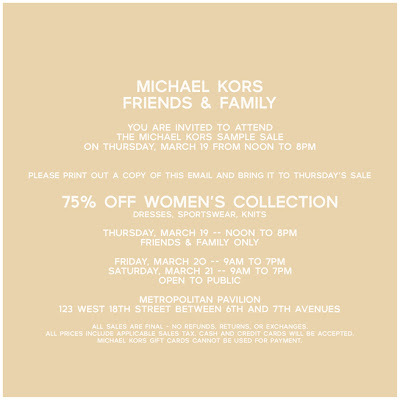 Print out the image below to check out the Michael Kors sale today. If you haven't signed up for the agnès b. newsletter, you might just consider it. Thursday, Mar 26 is customer appreciation night: all newsletter subscribers will get 20% off all items in the store (all stores) except beauty/perfume and leather. Sign up by sending your info to info@agnesb.net. Want first dibs on that Marchesa or Notte by Marchesa gown? Print out the invite below and go! Regular sale details here. You can read my sale reports from the sale in October here (starting prices) and here (final day prices). Now, onto the important stuff. 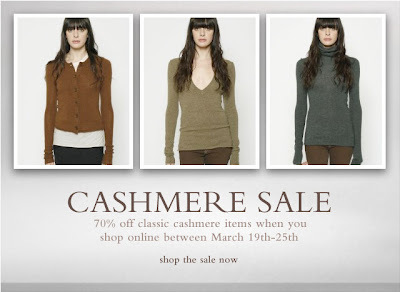 Starting today until next Wednesday, Mar 25, Inhabit NY is having a 70% off classic styles cashmere sale. Shop for Bliss or Remede products online and get 20% off with code "019904". Ends Sunday, Mar 22. Juicy Couture is doing F&F starting tomorrow. 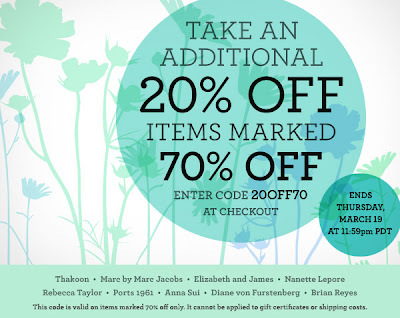 You can take 25% off "almost absolutely everything" (how is that for CYA?) in-store only. Print out the email flyer that's making the rounds. Ends Sunday, Mar 22. Ending today, Henri Bendel is doing a $50 off $150 promo. Use code "ELLE SNEAK PEEK" to shop online or print out the email to shop in-store. When/Where: Tuesday, March 17th and Wednesday, March 18th. Daily 10am—5pm. 220 W 19th St between Seventh and Eighth Aves, seventh floor (no phone). Use code "20OFF70" and take an extra 20% off the 70% off sale section at ShopBop! Ends Thursday, Mar 19. It's so exciting to get mail by USPS nowadays. I check the mailbox everyday, anticipating something good. Sometimes it's my trashy OK! Magazine or Condé Nast Traveler, which are good days. The better days are catalogs from Burberry, Baccarat, or Movado. The best days are sales notifications, like Barney's Warehouse Sale, Saks friends and family, or Tod's outlet store sales. Why are Tod's outlet store sales remarkable? Because it gets so cheap. Incredibly, ridiculously cheap. Fine print on the postcard says "Woodbury, Orlando, and Primm (Las Vegas) stores only. No phone orders, no pre-sales". *Of note: if you're heading out there anyway, Catherine Malandrino is supposed to have a (small) 90% off rack. Update: There is NO LANVIN SALE. Racked.com has done some investigatory journalism and concludes (with Lanvin's official PR weighing in) that reports of this too-good-to-be-true sale are FALSE. Daily Candy has just published some fabulous sample sales. I am so bummed that I'll be in San Francisco during the Lanvin and Me&Ro ones! Sob. Why: For one day only, more than 400 pieces are 70% off (or more!). Trench coats for $560 (reg. $3,900) and minidresses for $325 (reg. $1,560). 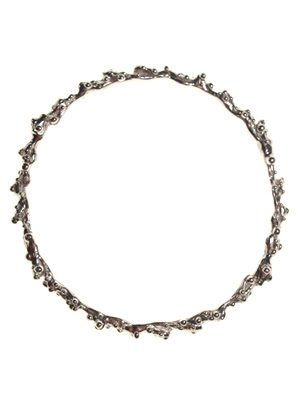 Why: Up to 75% off silver and 10- and 18-karat gold jewels. Why: Stunning gowns, cocktail frocks, and evening separates (sizes 0-12) for 50-80% off. Why: Sundresses, ’40s-inspired swimwear, sweaters, and jackets up to 80% off. When I was a little girl, I remember always looking at my mom's Puma socks. I'm pretty sure that "puma" was one of the first words of my budding vocabulary. (I just really liked the logo.) Then as I grew up, I liked LA Gear (remember those?) then Reebok then Nike then Adidas. At last, I've come full circle. If you too are dying to get your hands on some Alexander McQueen for Puma, use code "CAT25" and take 25% off your entire purchase. Ends Tuesday, Mar 31. 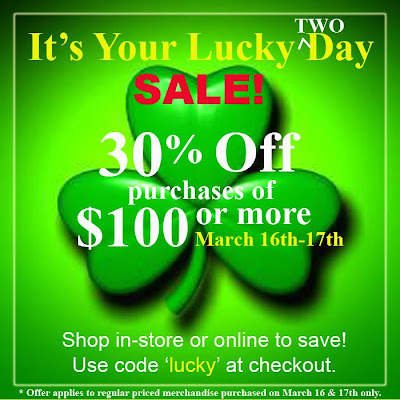 ShopEpic is offering a fab promotion for St. Paddy's Day: 30% off your purchase of $100+ (no sale items, though). Use code "LUCKY". Ends tomorrow, Mar 17. In continued competitive spirit and great customer service, Revolve Clothing is matching: also 30% off $100+, no sale items, and their standard list of brand restrictions apply. As a special advertiser promotion, Bluebee.com is doing 30% off all mens Paul Smith shoes and accessories. Use code "PSAM30" to shop online. If you use my link, you get free shipping too. Promo ends Sunday, Mar 22. Funky Soho jewelry boutique Stuart Moore is having a 'moving sale'. The sale runs until the end of July, when they actually do move, but why delay a good reason for discounting? Most of the inventory in the store is 10% off (think, no tax! ), with very few items 20-30% off, and even fewer at 50% off. However, the 50% off merchandise is a select group of diamond jewelry, so that could prove something worth looking at (including the ring I've pictured below). 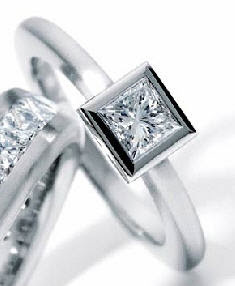 Overall their diamond engagement/band collections are 10% off. The associates told me that sales there are very rare-- their last sale was 6 years ago. After lunch at No. 28 (which is really awesome, BTW), my eagle eyes spotted a chalkboard sidewalk sign that said SAMPLE SALE! Let me just say I am very happy I checked it out. It looks like the entire store is pretty much on sale, eyeglasses and sunglasses priced from $50 to $175. It looked like from $50-100 you could find Emporio Armani, Miu Miu, Just Cavalli, Hugo Boss. A really good selection of Ray-Ban Wayfarers, even red, black, and camouflage, were only $100. Over $150 were most of the Persol, Dior, D&G, Valentino, Marc Jacobs, and Prada ($175). The staff was really nice, and you get proper matching cases with your purchases. I waltzed out the door with sporty Emporio Armani and huge Prada sunnies for a total of $225. Awesome. Yesterday the DH and I made another trip to Per Se. In these dark times, the silver lining, truly, is the the availability of tables at the best restaurants, and the abundance of extended Restaurant Week / prix fixe menus (Picholine, Daniel, Jean Georges). Since we've gone to Per Se so many times in the past 6 months, we've gotten to be very friendly with the people there. The DH is quite the foodie and loves to compare notes with the Captains on how to prepare Keller's food at home in our non-3-star-Michelin-tiny-NYC kitchens. They put us in touch with the French Laundry staff, who have graciously accommodated our request for a table when we're out there early May. Who says you have to use that guy who has scripted out Open Table? Find womens and mens athletic gear up to 50% off. There's only a teensy weensy Stella McCartney for Adidas selection, though. 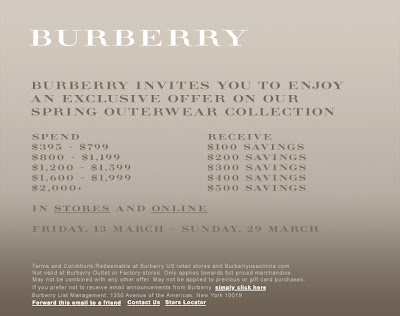 Your local Burberry retail boutiques (not outlets) and the online Burberry USA store is running a promotion through March, presumably to pick up sales. Spend some, save some. Ends Sunday, Mar 29. US only. For the next 4 days, BareNecessities is taking 25% off most of their womens t-shirts. The site carries brands like ADAM, C&C California, Hanro, Hard Tail, James Perse, Juicy Couture, La Perla, Splendid, and Three Dots. They are also doing free shipping with no minimum! Ends Monday, Mar 16. The versatile clutches and bags by Lauren Merkin are up to 75 percent off at the designer's spring sample sale. The Bianca shoulder bag is $225 (originally $525), the Eve clutch is $90 (originally $180), and the Lucy clutch is $80 (originally $250). When: 3/17–3/21; T–F (11–7), S (11–5). All fashionistas love the Pinkberry, so I thought I'd post this up for everyone to enjoy! NYC dwellers only (sorry LA). Ends Saturday, Mar 21. Click on the image to enlarge and print it out. As everyone knows, I'm a huge Tina Tang fan, and I encourage everyone in NYC to stop by her boutiques on Greenwich Ave, (if not just to gawk at the gorgeous Miu Miu bow satchel she has in her window). However, I also understand that you may live far away and be hesitant to buy expensive designer jewelry you haven't seen in person. Maybe the Clothingline gods heard our words of bitter bitter complaint. They've lowered prices (already!) Expand to see what Rogan, Loomstate, and the Soho 119 merchandise costs now. We all know in our hearts that you can't have a Mike & Chris sample sale without the drama, and they have not failed us. They bailed on NYC, and no-showed their first go-round in LA, and this *supposedly* is it. 3/12–3/14 Save on cashmere at the White + Warren spring 2009 sample sale. Cashmere cardigans and pullovers are $85 (originally $220), cashmere travel wraps are $125 (originally $275), and cotton cardigans and novelty sweaters are $50 (originally $165). 80 W. 40th St., nr. Sixth Ave., third fl. (212-298-3295); Th (12–7), F (8–7), S (9–3). BCBG's gut-busting promotion is back! Use code "SPRING09" to take $100 off your purchase of $300+. Not sure if this works in-store, end date unknown. Update: reader comment says it's a dud: "horrible sale as usual. overpriced for a sample sale, could get better deals at macy's sales"
Clothingline is having a busy week! Starting tomorrow they will have Rogan for men and women, Loomstate for men and women, and inventory from a Kansas City boutique. Starting Wednesday, Gustto merchandise will join the fray. - French Connection, Just Cavalli, Valentino, Havianas, Lucky Swim, Paul Frank, Diesel, Original Penguin, Ben Sherman, Blank Denim, Betsey Johnson and much more. It's about that time again! L'Occitane is having their F&F event starting Thursday, Mar 12 through Sunday, Mar 15. Take 20% off everything you buy online or in-store, on top of current discounts! 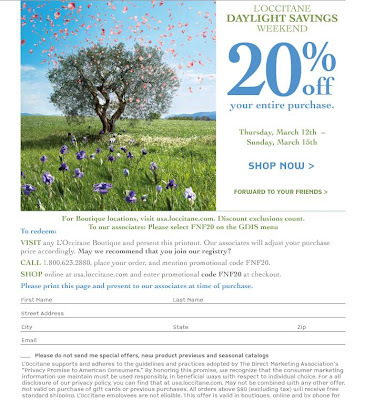 To shop online, use code "FNF20", or expand to print the email. Sorry for the lack of posts-- my hard drive died, and the lappy was sent to the shop. Back to business: for all the Brooks Brothers fans in the house: a warehouse sale! Someone I know who went said it is awesome. If you like Michael Kors, make sure to RSVP for the F&F preview on womens dresses, knits, and sportswear up to 75% off. Update: reader comment, "It was a great Pratesi sale. The sheets and cashmere throws and blankets were a wonderful bargain." Today is the last day, so if you were on the fence, head on over! It's about that time for fabulous linen sample sales: Bellino and Pratesi! • Twin, Queen and King sheet and duvet sets, retail $400-$600, now $160. • Jacquard 600-thread count Egyptian cotton, retail $750-800, now $200. • Terry towels 3-piece, now $20. • 100% Egyptian cotton tablecloths and napkins retail $40, starts at $60. • Waffle weave kimono style bathrobes from $40. • Percale and sateen quilted coverlets retail $400-$600, now $99 up to $149. Pratesi: up to 80% off Italian linens, bedding, towels, robes, table, and baby. All sales final. CC only. No children or strollers. Beautify your home in these dark times. The Ralph Lauren Home sample sale will include furniture, lighting, home accessories, gifts & antiques. I've always loved their bed frames. There will be a shipper will be available on premises. All shipping costs and arrangements are the responsibility of the customer. CC only. All Sales Final. No Returns. No Exchanges. If you are a Rachel Roy fan, mark your calendars. As a special advertiser promotion, Bluebee.com is doing 30% off all 7 For All Mankind denim. Use code "7FAM30B" to shop online. If you use my link, you get free shipping too. Promo ends Sunday, Mar 15. ADAM, formerly Adam+Eve, is hosting a "you-can't-miss-it" warehouse sale. Just in time for the soon-to-be warm weather, you can shop all of the spring and resort '08 women's collections. All of ADAM's timeless pieces are available with their rich concentration to detail, well-made lavish fabrications, beautiful prints, and comfy basics. The much sought-after ADAM line will be sold at 60-80% off of retail. 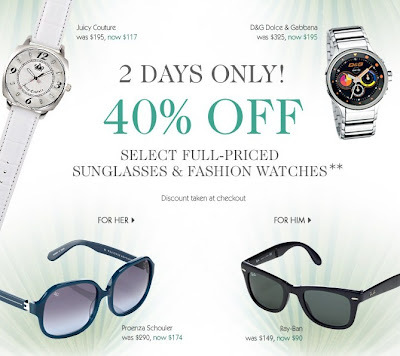 This sale offers a great selection of women's clothing, basics, and accessories. For more info visit www.PriveDesignerSales.com. Like Circuit City and Linens n' Things, Fortunoff is closing its doors for good. Their liquidation sale is underway and will probably go on for another 2 months. Everyone is keeping a close eye on the jewelry discounts: currently 10-30% everything, 25% off diamonds (except for solitaires and studs which are only 15% off). 10% off crystal and china and most everything else so far. If you've gone, please report back! Use code "SPSALE09" to take an additional 30% off and get free ground shipping on Cole Haan's sale merchandise. Great Value Styles excluded. Ends Monday, Mar 16. 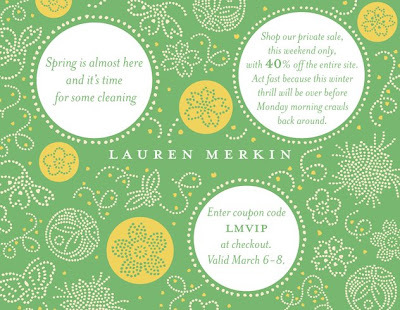 Lauren Merkin is doing a site-wide 40% off this weekend. Use code "LMVIP". Ends Sunday, Mar 8. My fav Euro shopping site, YOOX.com, is doing 15% off select "Wonder Woman" clothing (read: almost everything non-sale) until Sunday, Mar 8. Use code "WOMAN@YOOX" and get free standard shipping as well. It was nice to see the more casual short dress at a $300-400 price point, and your glam Prada/Proenza Schouler/Balenciaga is $1100. For strategy, I recommend shopping for non-American labels, and I especially think they have fabulous retail prices on Valentino and Armani.